March 12, 2015 0 comments on "How to Make a Camo Cake"
My twin boys recently celebrated their 10th birthday, and they wanted to have a Call of Duty theme for their birthday party. I am not an expert cake maker, so I needed to find something easy that my boys would still like. In the baking section of the grocery store I found a “camo cake” specialty cake mix, that cost about twice as much as a regular cake mix. It was really cool looking though, and what I was looking for, so we went ahead and got it. When I got home and read the directions, I realized I could have made it more inexpensively with items I already had on hand. Seriously, all you need are a white cake mix and green and brown food coloring. 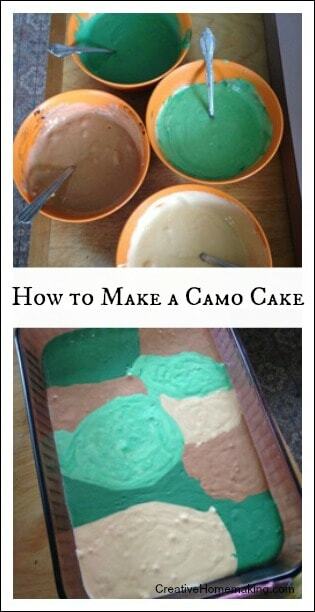 To make a camo cake, all you have to do is prepare a recipe for yellow or white cake. Divide the cake batter equally into four bowls. You will need two bottles of food coloring: green and brown. Use the green food coloring to create your desired shade of green in one of the bowls. To get dark green, add equal amounts of green and brown. To get tan, add just a drop or two of brown food coloring to one of the bowls. I have seen some camo cakes that also use black for one of the colors. 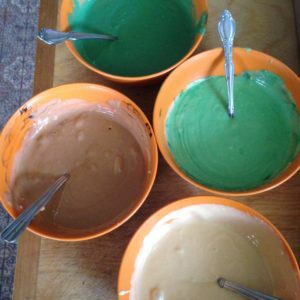 If you like, you can substitute black for one of the colors, or divide the batter into five bowls so you can add the extra color. Next grease a 13x9x2-inch baking dish. Take one of the bowls and pour about a third of the batter into a corner of the pan. Choose another color and pour about a third of the batter from that bowl next to the first batter you poured. I thought this part was going to be hard to do, but it was actually easy. Just try not to drip one color on top of another. Keep pouring different colors next to each other until the pan is filled. If you have batter left over when the pan is filled, just pour the leftover batter over the top of the same color(s) in the pan. Bake the cake according to the recipe directions. When you remove the cake from the oven, the top will be light brown and the colors will be pretty faded. When you cut into the cake, however, you will be happy to see the bright colors still intact.